Rotork was able to reassure the main contractor, engineering company and the end user by referring them to the nearby Repsol Refinery, where all the installed electric actuators are Rotork’s intelligent IQ design, together with the Rotork Pakscan two-wire digital control system. Although the specification for the Bens plant called for two hundred Rotork AWT range actuators, which are designed for simplified control duties in comparison to the IQ, they share the same watertight and non-breathing enclosure design. The watertight and dust tight enclosure, a benchmark of Rotork electric actuator designs, is rated to IP68 – IEC60529 and suitable for submersion to a depth of 7 metres for 72 hours. 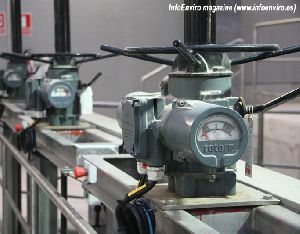 Rotork IQ actuators, this time with Profibus digital control, have also been installed at a water treatment plant in Munguia, providing further evidence of the Rotork enclosure’s ability to resist long-term exposure to corrosive environments without sacrificing reliability. The Bens WWTP illustrates Rotork’s ability to tailor the specification of the equipment it supplies to economically suit the technology, design and level of control required by the application. This ability has contributed to the company’s success in becoming a leading supplier of valve actuation equipment to the world’s water was waste treatment industry. Equally important, Rotork can provide locally based, life of plant service and maintenance support for its products, ensuring optimum plant performance and therefore low long-term cost of ownership.